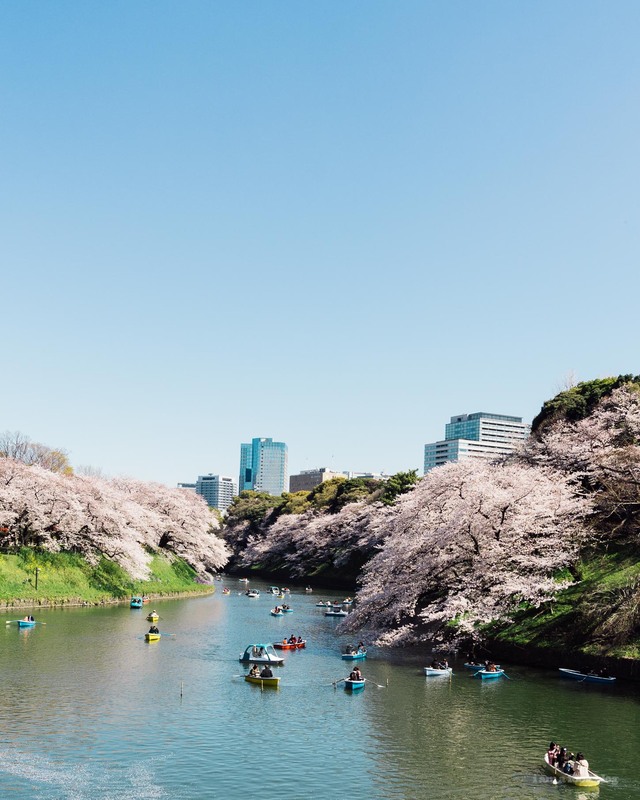 Our first time seeing sakura in Tokyo, plus what to eat and where to see the best sakura ever! 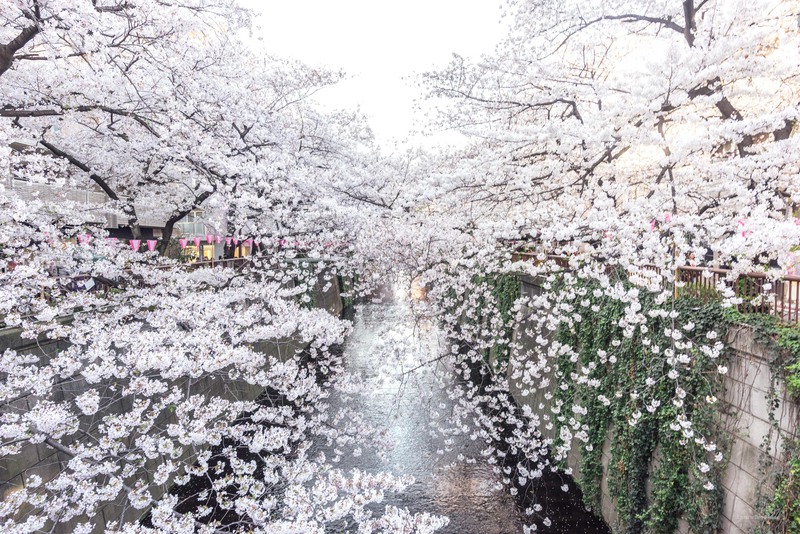 Being in Japan during sakura or cherry blossom season has always been on my bucket list. Still, it took Mike and I nine years of going to Japan before we actually got to see sakura. Not because we kept missing the season, or because we didn’t want to. To be honest, I’m not sure why it too us so long to get here. I think it was partially because I was scared of the stories about how cherry blossom season was the busiest season in Japan and partially because, well, we have Japan down pat. We know what we like and we know which season we like it in. Even so, this year is the year we broke our rut. This year is the year we finally made it to Japan to see the sakura! We almost didn’t because I told Mike that it wasn’t really a top priority of mine, but he insisted, saying that if we were going to go around the season, why not try to plan it for the peak. 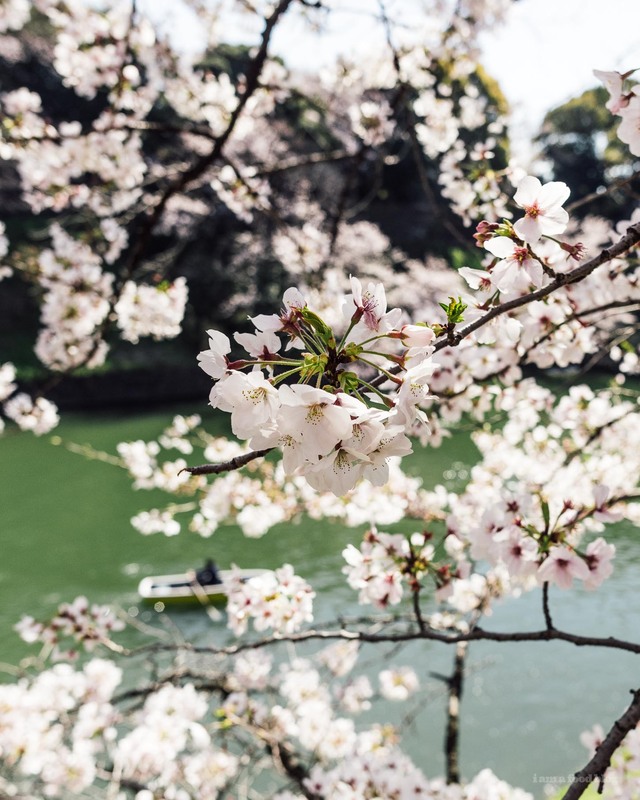 Cherry blossom season varies from year to year, depending on the weather, but it’s usually somewhere near the beginning of April. There are websites and calendars dedicated to telling you when the trees are blooming and when they will be at full bloom. 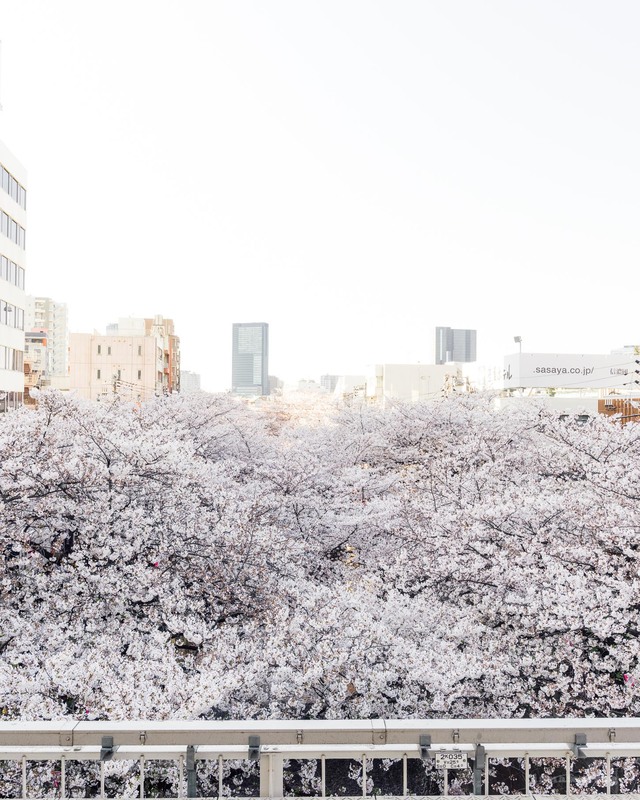 Full bloom is what you want: a gorgeous, generous canopy of fluffy white pink blossoms that are incredibly delicate and fleeting. 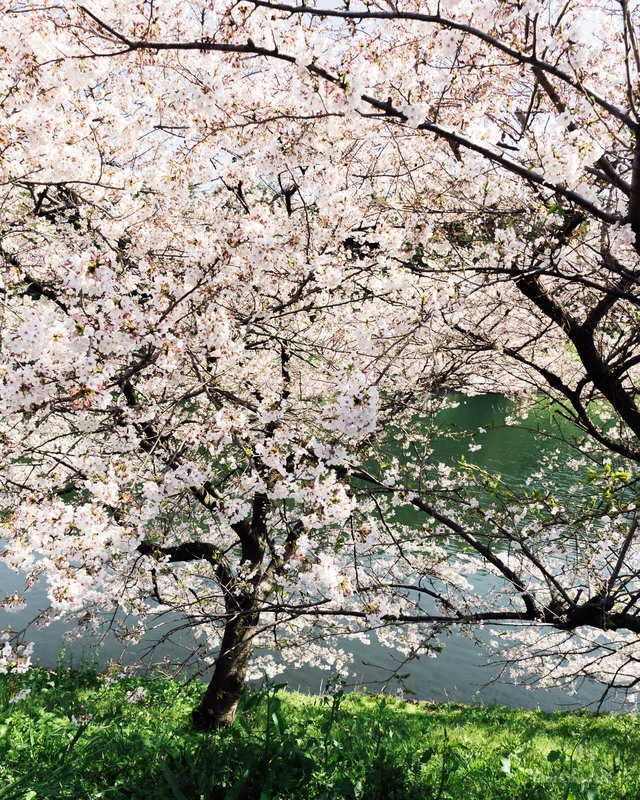 Their fleeting quality is what makes sakura so popular in Japan. In a culture that celebrates things in season and nature in general, they would of course, celebrate a natural phenomenon a both as a herald of spring and as an excuse to get drunk and eat delicious food. Somehow Mike and I (okay, it was really all Mike) managed to book our flight into Tokyo right at the start of the peak season. 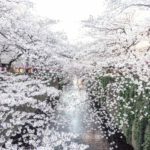 Our plan was: check out the blossoms in Tokyo for just one day before heading on a mini train trip to see some other lesser known parts of Japan. We landed in the afternoon after a very long flight (I managed to watch 4 movies! 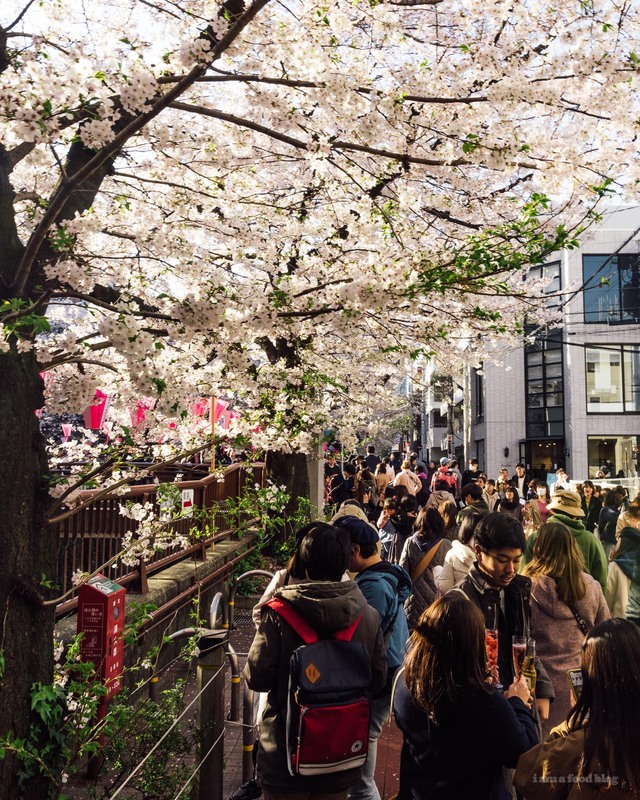 ), quickly dropped off our luggage at the hotel and headed out to one of the top cherry blossom spots in Tokyo: Nakameguro. Nakameguro, even without sakura, is a very fun neighborhood. There are a ton of cute little eateries, hipster cafes, and shops all around the station. 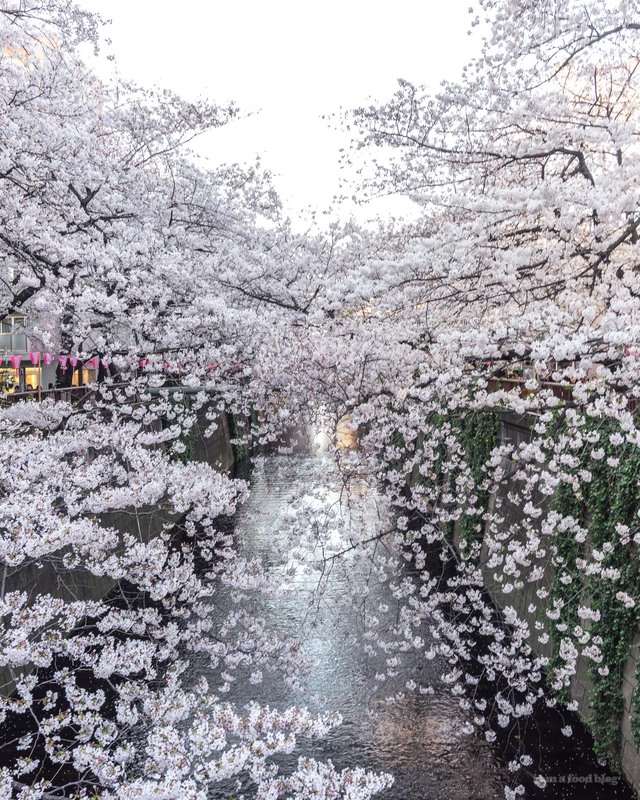 And, of course, there’s the Meguro river, which is lined with a dense population of sakura trees. The trees, next to the river, along with pink lanterns, is probably something you’ve seen on Instagram. It gets super busy, both day and night, with everyone politely (sometimes not so politely in tourist cases) jostling for the best photos. 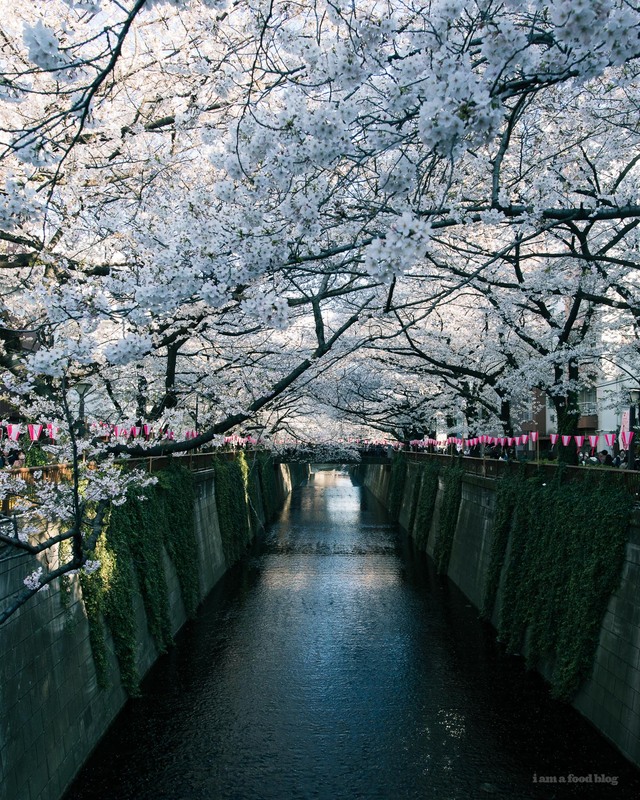 We loved the Nakame sakura (what locals call Nakameguro for short) so much that Mike dubbed it Naka Bae. Since we arrived in the afternoon, before most people got off work, it wasn’t absurdly busy. As the afternoon went on, it did get increasingly busier, but it was nothing like what I was scared it would be. If you don’t like crowds, this probably won’t be the place for you, but it wasn’t as busy as the time we went to see the winter illuminations – now that was intense. The best part of Nakame, after the blossoms, which were absolutely delightful, was the street food. There were a bunch of vendors set up on both sides of the river, selling sakura themed food and drinks. Think: strawberry everything, pink champagne, and all your classic Japanese festival foods. I had a grilled mochi covered in a thick, sweet, garlicky sauce. It was crisp and chewy at the same time and seriously so good. 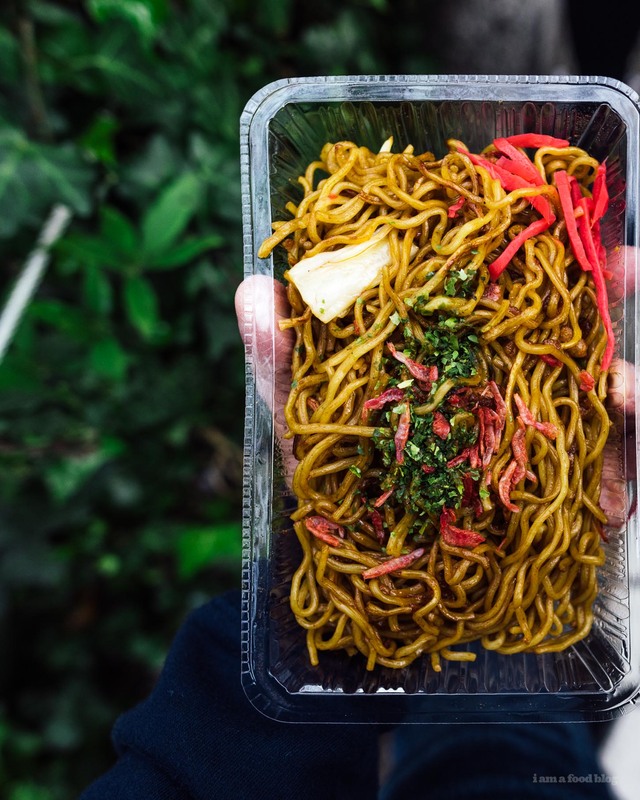 We also had some classic Japanese festival street food: yakisoba. I wanted to eat all the things, especially the long fries and the tornado sausage, but we wanted to visit another sakura site so we didn’t eat as much as we could have. But seriously, I love street food and there was SO MUCH! Some of the more popular things I saw people having were: strawberry drinks, strawberries on a stick, boba drinks, takoyaki, grilled mochi, and miso dango. After Nakame, we headed to Chidorigafuchi park, which is right near the Emperor’s place. Sadly there was no street food there. We got there right at sunset, when they started to light up all the sakura. It was very, very pretty, but it was also so BUSY. Busier than Nakame, and that was already bustling by the time we left. It seemed like there were more out of town tourists at Chidorigafuchi and more local young peeps at Nakameguro. I liked the way the sakura looked at night, but it wasn’t really what I think of when I think of cherry blossoms, so after a quick stroll and ten thousand pictures, we called it and decided to come again to visit in the morning. The next day there still wasn’t any street food, but it was a lot less busier. 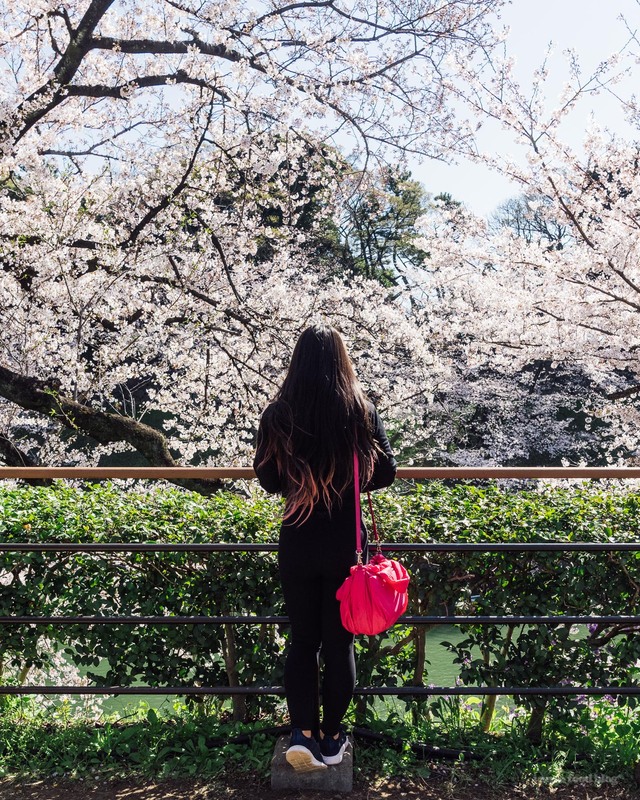 The canopy of cherry blossoms at Chiodorifuchi is gorgeous. As you walk along the moat, you can see people out on boats, and the color of the moat next to the pink of the blossoms is perfection. I’m so happy we came back during the day. We walked around most of the of moat and got to see all the people who were already staking out their claims for hanami viewing parties. Hanami is when groups of people picnic under the sakura trees. You get a bunch of friends, food, and alcohol and hang out, drinking and eating and enjoying the cherry blossoms. There were huge blue tarps laid out, with just one lonely guy or girl just hanging in the middle. Unfortunately, we didn’t get a chance to hanami because we were leaving Tokyo. But hopefully we’ll get a chance to in one of the other places we’re visiting. If we do, I’m pretty sure it’s going to be awesome. And that was it! 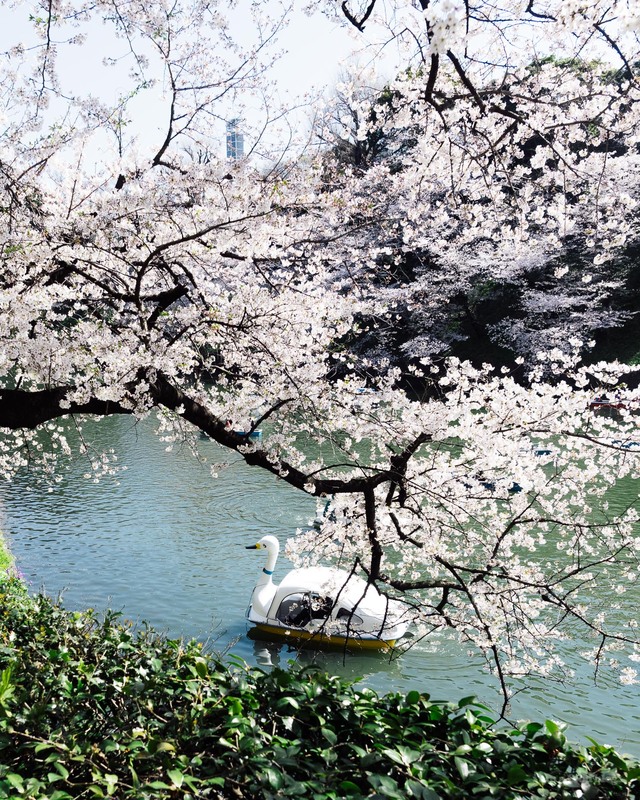 An afternoon and morning of Tokyo’s best sakura. We’re literally on a shinkansen (bullet train) while I’m writing up this post. We’re headed down south and Mike and I are the only ones on the train. 1. Bring a tarp. You’ll see giant blue tarps with one lonely person hanging out in the middle of them. They’re just waiting for their friends. 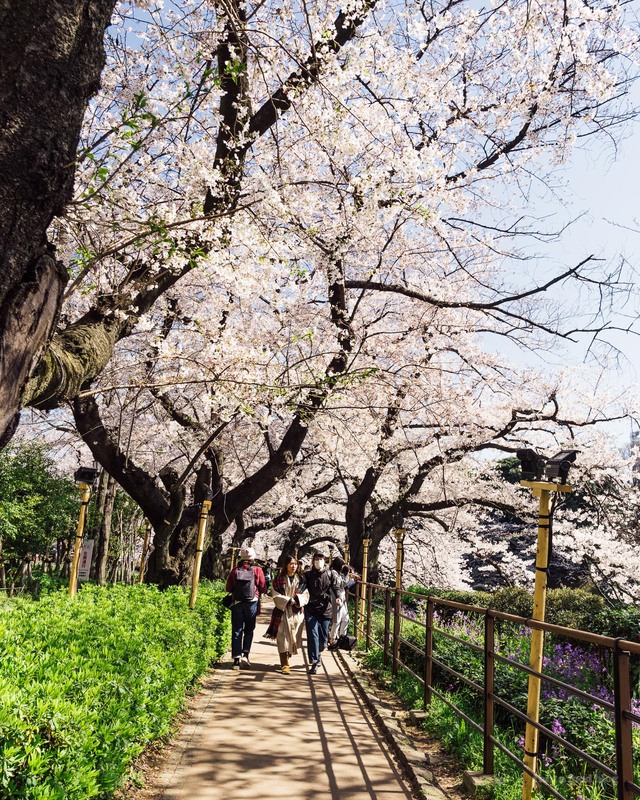 Usually, one person will come early in the morning to secure a good spot and friends or office mates will trade off during the day to ensure that they have the best space to hanami. You can grab a cheap tarp at any 100 yen shop. 2. Grab some drinks. Alcohol is a big part of hanami, so if you’re going to do it right, you need to get your drank on! Visit a combini – 7-11 or Lawson’s is always a good choice – and grab some drinks. It’s perfectly acceptable and what everyone means when they say they are going to “see” sakura. 3. FOOD! You’ll need some snacks with your alcohol. 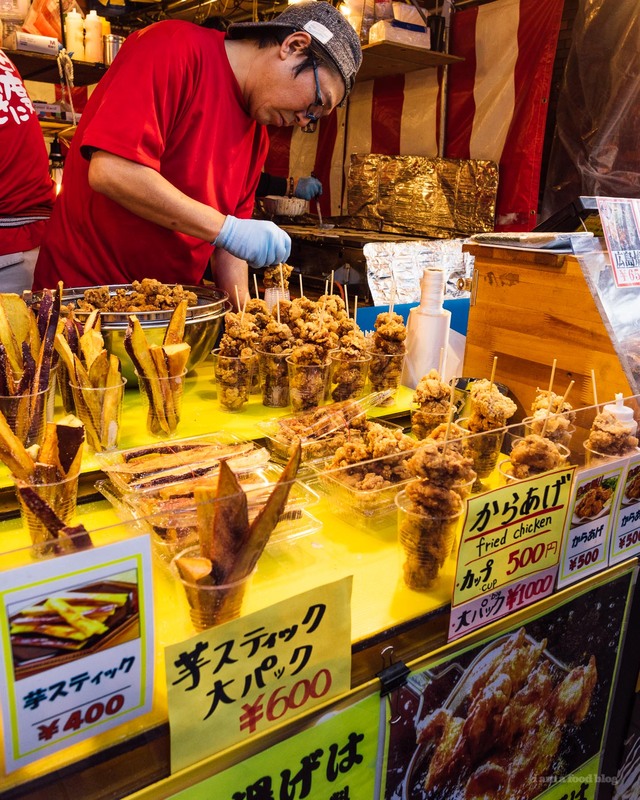 Depending on where you hanami, they’re may or may not be food stalls. If there are, of course buy the food at the foods stalls. Otherwise, I’ve been seeing a lot of Uber Eats hanami ads where people literally uber their food to their tarps. Of course, convenience store food or food from a food hall works too! 4. Don’t be disheartened if you can’t sit down. It’s seriously competitive and well, you can just as easily enjoy food and drink while standing around near the food stalls. It’s just as pretty and the food will taste the same sitting or standing. 5. Bring some napkins/wet wipes. Most vendors don’t have them. Sometimes they do, but if you’re a messy eater, like me, just bring your own, you won’t regret it! Great, helpful super focused travel story. Thanks. closest I’ve been to Tokyo is the airport, so am definitely itching to take another look, hopefully during sakura season based on your post, so thank you!